When it comes to home defense, you want a serious goddamned shotgun. There’s also something deeply satisfying about a shotgun, because you know it’s going to take care of business at close range. But we all know there’s a problem with shotguns, well a couple of problems. Capacity – A shotgun normally doesn’t hold many rounds. Reloading – It’s too slow. These are tactical flaws in most modern pump-action shotguns. For us, a tactical shotgun is a weapon that beats these problems, either with a massive capacity or a quick reload system. It’s really that simple. The rails for lamps and lasers, they’re less important. Pretty soon, if the government and your specific State lets us have nice things, we should have 30-round mag fed shotguns that behave just like an AR-15. 2018 is definitely the year of mag-fed shotguns and we’ll do a separate list for them soon, but we wanted to show you ALL the high-capacity tactical shotguns and show you different solutions to a common problem. So, what are the best home defense shotguns for sale right now? And why? It’s a mag-fed pump action shotgun with a 10+1 capacity. And they will sell you a 20-round magazine as an accessory. These mags never drop out quite as cleanly as an AR-15, but it’s close enough. You really can reload on the go and suddenly you’ve got as many shells as you can pack in advance to send downstream. This could be the equalizer in a home invasion. It’s a different approach to the Kel-Tec KSG and Tavor, but it’s simpler and that can be a good thing. This is the gun you could reload on the go and that gives it a competitive advantage. We like this gun a lot. It’s probably the best mag-fed shotgun on the market right now, although it is slightly picky on the ammo it will take and you need to find a good match for the mag-feed system. Longer ammo shells can block it up, so stick religiously to quality 2 and ¾ inch ammo and you should be good. This is an issue, but it’s an issue you can fix at the range. The capacity of that mag makes its slightly picky appetite bearable. It does take a wide range of slugs and buckshot, too, so you could have this one weapon and a mag belt with different solutions to your particular problem. If you want to switch to slugs then this becomes an absolutely devastating weapon at distances of up to 100 yards. That’s when you need to think about optics and lasers to go for the full tactical style. 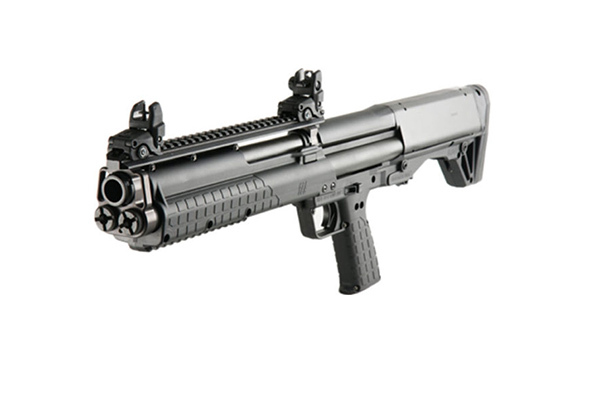 It weighs 7.75lb, it’s a pretty tactical set-up that brings the Benelli M4 tactical shotgun to mind, apart from the magazine. It’s a kickass gun that might be the ultimate in home defense right now. Add a mag belt and you’ve got more than 100 shotgun shells to fire at people. This gun could totally redefine the shotgun world. It shoots 15+1 rounds of basic 2 3/4” shotgun shells thanks to rotating tubes that hold the rounds at the front. The loading tube is basically a carousel and you get five rounds in each tube and one in the chamber. When some brave soul puts minishells in there to test the theory, there’s no reason why we can”t have 24+1 rounds in this one weapon. That would make it the first choice for home defense in more or less anybody’s house. Use buckshot to give yourself more room to miss in a high-stress situation. It’s also harder to send buckshot through walls, whereas slugs can end up anywhere. Buckshot in a bigass shotgun like this is the best way to make a huge amount of noise and use good old-fashioned shock and awe to make any intruder think twice. It’s a big, intimidating gun that you can dress up with lasers and lights if you want. It’s a bullpup design and 8.85lb without shells, but it’s also an engineering masterpiece from IWI in Israel. All you need to do is push a button and rotate the tube. When the gun finds a shell lined up then it feeds it automatically. So this is as semi-automatic as shotguns tend to get. It’s a gamechanger, we love it, it’s expensive and we don’t care. The IWI Tavor TS12 is one of the best shotgun for sale in the world right now for home defense. The Mossberg just feels that little bit less complicated and that little bit more versatile. But it’s close. It is reasonably fast to reload through a rear-facing tube. But you will have to fish out loose shells and feed them in, so you’ll probably be feeding five and shooting after the first onslaught. If Tavor can figure out a speedloader, though, then this sci-fi beast of a gun is going to be the one you want. Honestly, pound for pound, and certainly in terms of bang for buck, the Kel Tec KSG could still be the best ‘assault shotgun’ in the world. 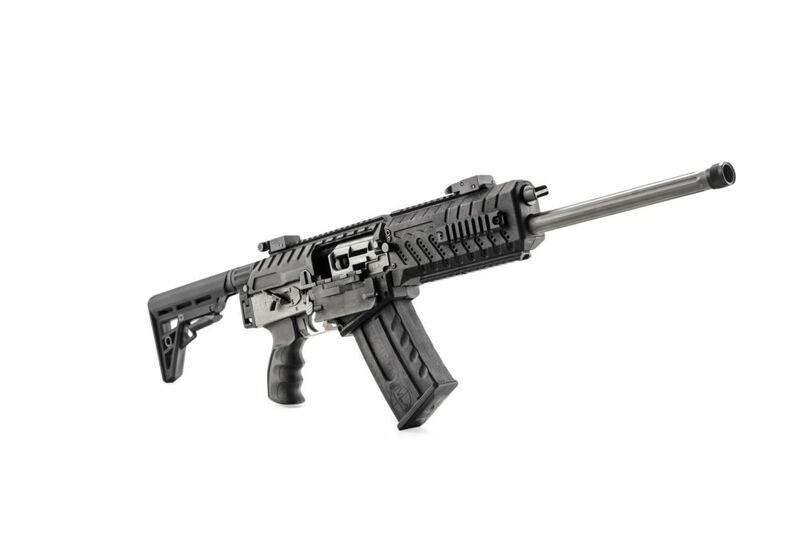 The Tavor TS12 is new and exciting, and just that little bit better. 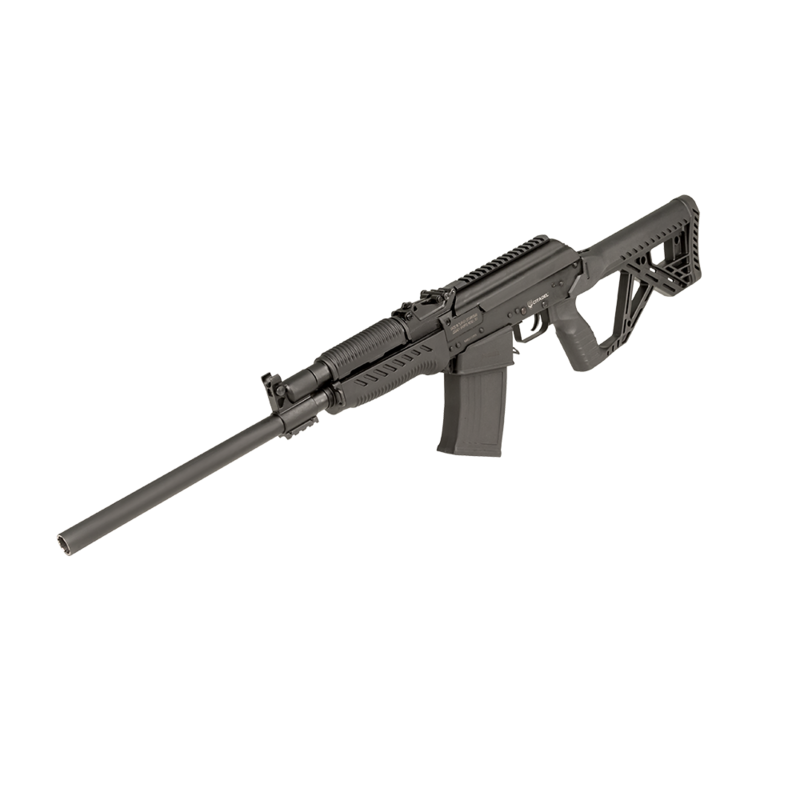 But if you’re on a budget then forget it, the Kel-Tec will give you almost the same firepower for half the money. It’s much smaller, too, which could actually be handy. Again the KSG is a bullpup, but it’s just much more compact and it weighs 6.9lb. That’s not a hell of a lot, and the whole gun is just 26 inches long. There is also a roaring trade in aftermarket parts for the Kel-Tec. You can get everything from a spear to a pistol grip for the pump action. This is the cheaper, more fun high-capacity shotgun. The Tavor is more serious. Even eBay is awash with cheap aftermarket tuning parts for the Kel-Tec KSG. There have also been too many failure to feed issues reported on the web to ignore. Make sure yours is clean, straight away, with at least 100 rounds of 12 gauge down the range or in the field. Do that, get a clean Kel-Tec KSG and they’re amazing. The gun uses two separate tubes for a 14+1 capacity. This one has been tested with minishells, too,a and you get 25 in the gun without any issues. So this one is more compact that an AR-15, weighs about the same and kicks out 25 rounds of mini shotgun shells. You could use slugs with the minishells, although we’d use buckshot still. And there you have a potent weapon for taking out the trash. You need to switch a lever manually to switch between tubes to make the whole thing legal, but you get used to that. The Tavor still wins, just, but honestly this is almost as good a weapon for way, way less money. Reloading takes time. So really you’ve kind of got what you’ve got, then you’ll have to ditch the weapon and go to your back-up. If that’s 25 shots, though, then you’ve got a war on your hands in any case. This really is a street legal sawn off shotgun with a mag feed. It’s quite the thing isn’t it? It’s almost worth the money, but that is a fair chunk of change for something that looks so brutally basic. For a home invasion set-up, this gun with the 10-round mags might just be the perfect solution though. It’s one of the smallest guns here, it comes with a rugged pump action grip and a pistol grip on the other end. It’s the post Apocalypse gun you’d want on your shoulder, because it frees up space for something else and it would be untouchable in close quarters. You can shoot this from the hip and it also comes with the forearm support to shoot one-handed if you need to. The nestle that stock into your shoulder and it’s an SBR with shotgun shells. This is a firearm, not a shotgun, so there’s no NFA paperwork or $5 fee. It is so much more expensive than the Shockwave that features further down the list, and I’m not sure it’s not much more gun, but it is a fascinating thing. You want one, and you know it. You could eve dump the stock and run this from the hip with a pistol grip. Then it becomes the ultimate urban warfare gun and a frightening little tool. If money is no object, then yeah this is the coolest gun on this list by a million miles. Gamers will know it from the Warface franchise. Now it’s here and it’s real. This a modular kit that gives you everything from an 18.5” barrel to a 10” SMG-style set-up that still kicks out heavyweight 12-gauge buckshot. Buy the full kit and you’re staring down the barrel of a 5K bill, but then there really isn’t any other weapon like this. You could use it for hunting, then switch out the barrel and turn it into the first port of call for your home defense. It’s a tactical shotgun like no other and you simply might not have heard of it. It’s an AK-style shotgun, if you want to call it that and you can order 8-round mags. Keep two or three with you and your shotgun is now a monster of a tactical shotgun with all kinds of options. You’ll spend 3K before you get started with the spare mags. But then this might just be the best solution on the open market if you’re looking for a mag fed shotgun and you just don’t care about the price. You can hunt with this, defend your home and then go out in the morning and blast a turkey clean out. It is a different kind of shotgun. Is it worth the money? Not really, is the only problem. The 10-round mag on this Remingto 870 DM does put it right back into the limited world of normal shotguns. In fact, with an extended tube you can do better than that right now. But the mag is quick to switch out. It’s a good system and Remington has worked hard on this one. It isn’t just a poorly thought out conversion. The shotgun is based on the most ubiquitous shotgun in the world. The Remington 870 is part of American history, and now it just got better. The company swears this mag will eat any ammo, 3 inch or 2 and ¾ inch shells, slugs and anything else you care to put through it. You can also drop the mag fast, slot another one home and you’re good to go. It’s a more complete weapon in some respects than the Mossberg, but it just loses out when it comes to capacity and a high-capacity shotgun is a thing of beauty. You can’t get a bigger mag, yet, but we guess that’s coming. Until then you can carry spare mags and turn your Remington 870 DM into your main home defense weapon. It’s also just a badass shotgun that will be a lot of fun to shoot. When the bigger mags land, though, this gun could skyrocket to number one in the ratings. It looks a little like a DIY SMG, but really this is a 12 gauge shotgun that has borrowed heavily from the world of SBRs. It uses a magazine and although the stock option is 5+1, you can order a 10-round mag. That turns this into a potent weapon, although it isn’t quite a match for the Mossberg. This video, it’s so dark and redneck, especially with the black female mannequin getting shot up, that it kind of appealed to me. It’s just so wrong and this man is every Leftist’s nightmare. For that reason, I kinda like him. In some ways, one of the cheapest of the bunch is also the most useful. You don’t need to look too hard to see the Shockwave origins and that means it skirts the NFA paperwork and the excrutiating waiting period, because it’s a firearm not a shotgun. Black Aces Tactical made it look suitably badass and then turned it into one of the best mag-fed shotguns, sorry, firearms, on the market. You have to go digging in their website to find the optional 10-round mag, but it’s there, which means you’ve got 10+1 rounds and you can have 10 more ready to go in record time. Now this is a third party conversion and we can’t expect it to work quite as slickly as the Remington. That’s life, but it’s also a lot, lot cheaper. It’s smaller, too, and we can see this being a useful truck gun, or home defense weapon. 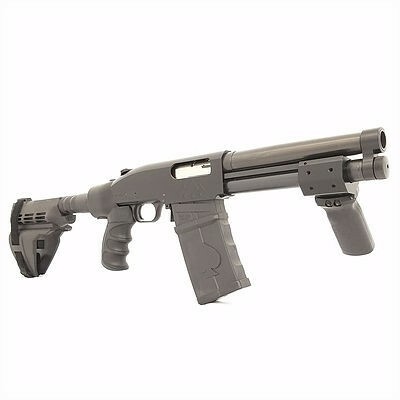 It’s a different kind of tactical home defense shotgun that might just suit you better. If you have this by your side, and a few spare mags, then you’re almost ready for any close-quarters altercation. It’s that kind of gun, Tacti-cool it to all hell with lamps and lasers, and bayonet points. Do what you like and if you’re struggling for ideas then you can get parts here. You get two five-round mags and a 20-inch barrel that has been tuned for lethal accuracy. So you get a longer range with this gun and you can easily add laser sights on an RMR if that’s the way you want to go. Basically this gun could deal with everything from home defense to bears and if something can take 5 slugs from this then there’s not much else you could have done. It is designed for pure accuracy, which takes your shotgun from a 10-yard weapon to 20 or even 30 with buckshot, and up to 100 yards with slugs. It’s an intriguing weapon and a larger mag would turn it into a viable hunting tool, as well as a wicked bad defense weapon. Add a lamp, a laser or even a scope and this is a serious tactical shotgun for home defense, hunting and even taking a turkey down. You need more space to swing it around, it’s a long gun in this company, but you get the support you need to nail every shot when it counts. This isn’t a clever shotgun at all. 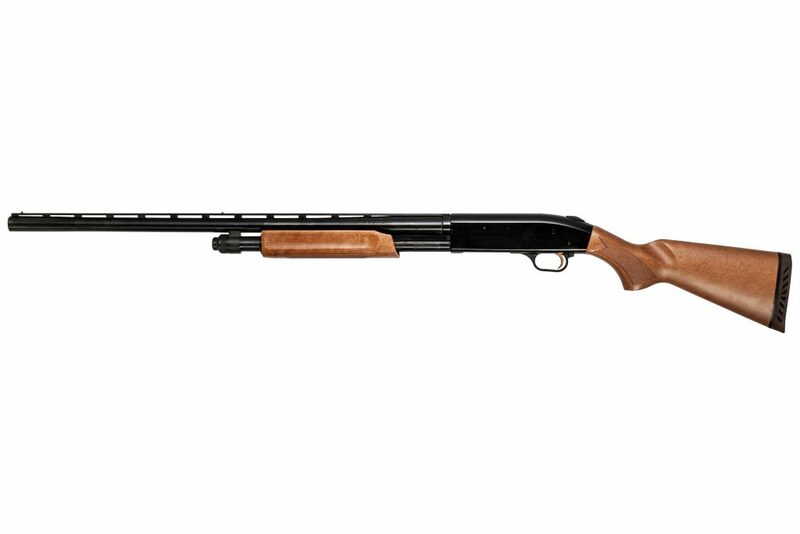 The Mossberg 835 is a classic hunting shotgun that just happens to pack an outrageous capacity. This is a workhorse turkey blaster that just so happens to pack in an a lot of shells. It’s a long weapon and that counts against it when it comes to the tactical element. But it’s tried and trusted technology and just a shitload of shells in a super accurate long-barrel shotgun. The Mossberg is also the cheapest weapon here by a mile. If you go for minishells, and this thing will eat just about anything, then you could increase that capacity to 15 +1. Then it’s a serious proposition for your home defense. You would still want to carry a back-up handgun, but this is a cost-effective way to get serious shotgun capacity in your home defense set-up. Post originally appeared on USA Gun Shop. Go there for great deals on some superb firearms.